Aluminium Walking Stick Stool Lightweight and Foldable. Robust light folding stick stool with canvas seat which can be used as a walking stick. Gives stable seat for resting when tired, a very useful item. 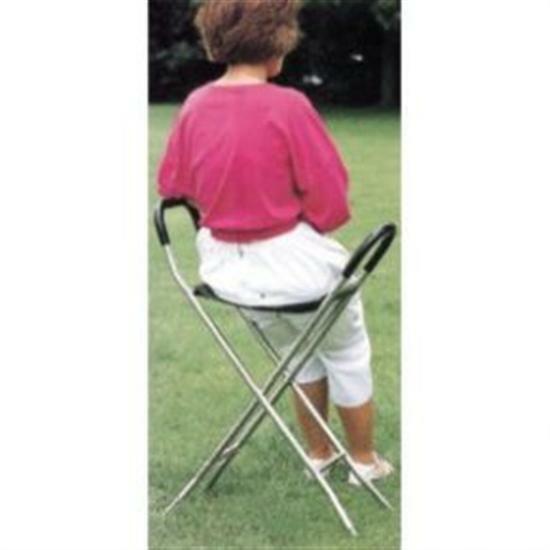 A lightweight aluminium walking stick stool, it can be folded flat and strapped together to make a sturdy, robust walking stick that is able to provide great support. Once opened, it has a four legged design that offers a safe, secure and comfortable place to rest when required. Should be good when the water level falls. Bought to complement a National Trust stool bought many years ago. Now both myself and my wife need rests on outings!! Your stool is the equal of the NT stool, but cheaper and lighter. A good purchase. I was looking for a walking stick stool to take on holiday to Rome in a couple of months time. After searching the web I came across Active Mobility centre and found the very thing I wanted My order was placed on line and I immediately had confirmation of delivery date etc.The walking stick stool is perfect for my needs and I am sure I ill get great use from it. Thank you to all at Active Mobility, for such prompt service. I know who to contact for any thing in the future. Excellent service, the parcel arrived very quickly. The stool looks good quality, is very light and folds up very neatly and easily. I look forward to using it. Excellant product with fantastic service sand delivery. The seat is just what I wanted, so I certainly recommend to anyone else. The problem was with the courier. They managed to smash the box around (maybe too big?) & then get lost & take no attempt to re-deliver until I complained. Active mobility were helpful and polite throughout, helping ensure the couriers finally delivered! One star missing for courier! A brillant item. My husband is finding it a great help. It gives him confidence to know he can stop and sit down when he needs to when out and about. Delighted with my purchase , will make a huge difference to places I can go to give me stability. Husband not well enough to try it out yet so cannot comment on product but service was excellent. Will let you know later how we get when he is a little stronger. Excellent. It does everything I hoped. Very light to carry, easy to set up, stable to balance on, I've had no problems with it yet. The stool was an absolute godsend. Sturdy, but lightweight to transport. The aftercare from this company is amazing. Excellent product. Purchase process very straightforward. Excellent product, just what I have been looking for. First class service. My mother is very pleased with the walking stick stool. Beautiful! Thank you. Saw one used by Bernard Cribbins on Antiques Road Trip! Found nothing like it available in Sweden. Friendly and fast service. Perfect for travel and queues! It came quickly and well packaged. Good sturdy design and can't wait to use it out and about. Great product, very pleased with it. Excellent service and received within a couple of days of ordering. What I wanted . No delay on delivery . Happy . Haven't used it much yet but seems like a sturdy seat compared with many other cheaper models I have seen. Delivery good and sure I will deal with this Company again.